I am still perplexed at the audacious and bizarre theft I fell victim to. Somebody, apparently in need of the weather strip (AKA "seaming welt") for the front of their NB Miata has taken mine. Now, if it were a fast and easy job, I would not be surprised, because this part's retail value is maybe $50-70 new--not worth the risk of being arrested for attempt to steal the rubber, which in my case has 10 years of exposure to elements on it. I have highlighted the part on the picture, and you will see that it is held in place by a metal strip, which is held to the top itself by seven (yes 7) screws. Now comes the absolutely fucked-up nut-job part. Not only has the thief taken the time to unscrew all of the seven screws to get to the rubber weather strip, s/he has actually replaced the metal strip used to hold the rubber using all seven screws! 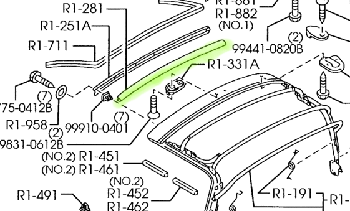 So bizarre that it made me doubt my own sanity and check in the parts catalog (where the picture came from) and google for pictures of Miata soft tops to make sure I did not imagine that weather strip where now is nothing. It took me a few days to notice the missing part too, because the weather was nice and I didn't need to put the top up. Once it was up though and I was on the way to the gymkhana, the horrendous wind noise from the top of the windshield, where it meets the vinyl top, quickly made me aware that something was wrong. Miata interior is pretty loud under best of conditions, but the wind was drowning out the engine and the tire noise! At first I thought one of the latches was not fastened properly, but after refastening both latches I found out this was not the case. A closer inspection showed that the rubber from the front of the soft top was missing and there were tool marks on the screws. Knowing that screws on this top were last touched by loving hands at the Mazda factory, I had to accept the fact that someone was screwy enough to actually do this. It is more amusing and puzzling than annoying to me. Particularly because I can get stock parts at serious discounts through the Mazdaspeed Motorsports program, and I was contemplating upgrading the weather stripping anyway. Still, it boggles my mind.